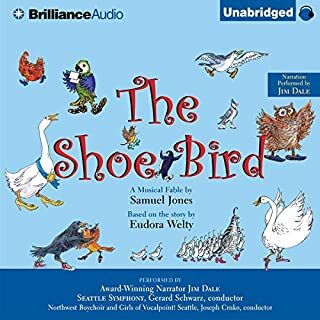 In The Shoe Bird, Jim Dale brings to life a flock of unforgettable bird characters: Arturo the parrot, Gloria the goose, Minerva the owl, and even the extinct Dodo! This is Eudora Welty's fantastical story of how some feathered friends made a fateful switch from flying to wearing shoes, little knowing that they would soon become the prey of Freddy the Cat! Story well performed, creative and imaginative. However, the volume must be continually adjusted in order to listen. I have never returned an audible book, but I will return this one. It's a shame, my children really enjoyed this. Story on caliber with Leonard Bernsteins Peter and the Wolf. After having lived in the Netherlands for several years, I was delighted to enjoy this authentic book with my children. 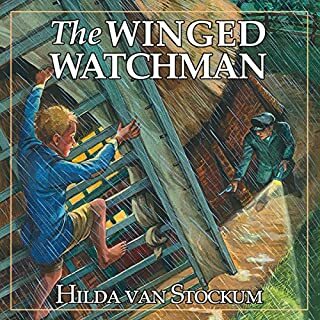 A thoughtful, moving story that will cause you to pause and think and rejoice without sappy manipulation so common in contemporary children's literature. Beautiful themes of compassion, duty, forgiveness. Excellently presented. First rate all around.